Bone ash is made from selected bones properly leached, ground, chemically treated, calcined by a special procedure and milled to a small particle size. Our bone ash is obtained by roasting degelatinized bone up to a temperature of approximately 1100° C. Afterwards, the bone ash is cooled and ground to a fine particle size so that a minimum of 95% will pass through a 325-mesh (U.S. Standard) sieve. The excellent properties of bone ash is attributed to the internal structure of the small, individual particles. The original cellular structure of the bone is preserved, thus giving the material a high resistance to heat transfer (natural thermal insulator). 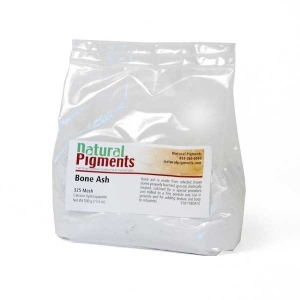 Bone ash is primarily tri-calcium phosphate or a form of calcium hydroxyapatite. In painting grounds, it makes a durable surface while adding some tooth especially for egg and casein tempera, distemper, encaustic and oil painting. Use in chalk and gesso grounds to increase absorbency and add texture. Bone ash is used in Cennino’s recipe for silverpoint grounds. Add to oil colors and mediums to create textural and bodying qualities to oil paint without affecting the color. 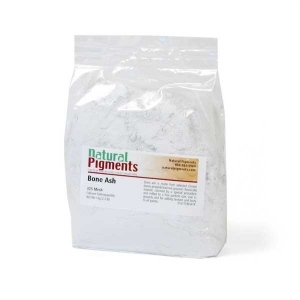 Bone ash has little color in drying oil, so it can be added to oil paint without affecting the color temperature. Put half of the required water together with all the bone ash powder in a container. Add enough water to get a good mixing action. Continue mixing until lump free and uniform consistency is obtained. Do not vortex the mixture in order to avoid air entrainment. Add the remaining water as required by the formula or recipe.